While a transistor-based cable shutter release does the job, it has one drawback. 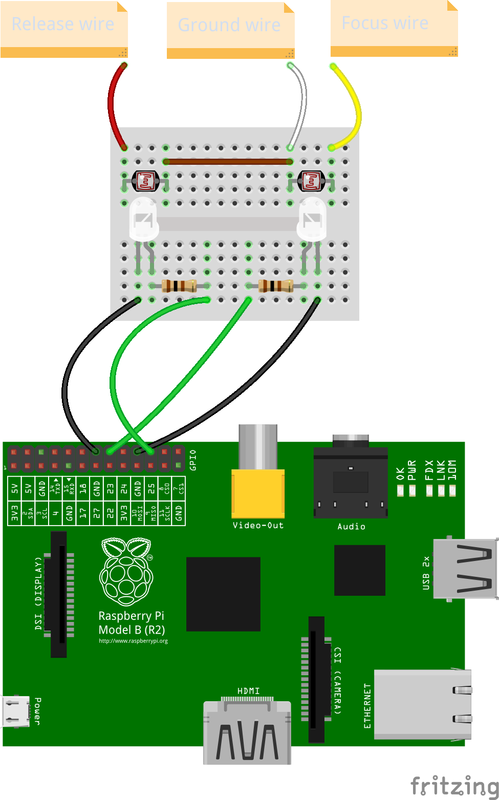 Grounding the camera to Raspberry Pi can cause the machine or the camera to have a negative ground. This might lead to a higher total voltage difference and could damage either of them. One way to solve this problem is to separate the camera and Raspberry Pi circuits using optocouplers (or opto-isolators). For better results, you might want to put heat-shrink tubing around the components to improve light transmission and prevent accidental light streaks (as well as make the DIY optocoupler assembly more sturdy). The LDR acts as a simple circuit switch: when the light hits the LDR, its resistance drops, thus closing the circuit. It might not be an optocoupler in the true sense of the word, but it serves well this particular purpose. Replacing transistors with opto-isolators also simplifies the overall design, and you can use the diagram above to wire the circuits. This DIY article was okay, though there is no data as to what type of Sony camera or how to wire it to the camera, and no sample program to start with… I think you left out the “How-To” portion of your article..
…..rarely induce spurious noise, nor respond to false signals riding in noise, and makes simple impedance matching issues. Sorry for the poor grammar of the first post.